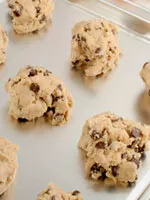 The Food and Drug Administration announced a recall of Nestle Toll House refrigerated cookie dough today due to contamination with E. coli O157:H7, a type of bacteria that can cause cramps, vomiting, blood diarrhea, and a more serious condition that can result in kidney failure. FRIDAY, June 19, 2009 (Health.com) — The Food and Drug Administration (FDA) announced a recall of Nestlé Toll House refrigerated cookie dough today due to contamination with E. coli O157:H7, a type of bacteria that can cause cramps, vomiting, bloody diarrhea, and a more serious condition that can result in kidney failure. So far, no deaths have been linked to the contaminated dough, but since March it has caused at least 66 cases of illness in 28 states. Twenty-five people have been hospitalized and seven have developed hemolytic uremic syndrome (HUS), a potentially life-threatening complication. Anyone can get sick, but most healthy adults recover after about a week. Young children and the elderly are at the greatest risk of HUS, which can lead to kidney damage, the FDA says. The FDA and the Centers for Disease Control and Prevention are continuing to investigate the cases. In the meantime, the FDA recommends throwing away any prepackaged, refrigerated Nestlé Toll House cookie-dough products. Nestlé recommends that people avoid the products on this list. "We want to strongly advise consumers that raw cookie dough should not be eaten," they said in a statement. The FDA says “cooking the dough is not recommended because consumers might get the bacteria on their hands and on other cooking surfaces." Anyone who has recently eaten such products (or gotten ill after doing so) should contact his or her doctor, who can report cases to the state or local health agencies.